The online mall helps people sort through product choice, but it is not the only method they use to assess products and not a place where people often close the deal. The internet is a valuable research tool for online shoppers and at times provides information that is critically important in purchase decisions. Yet, more often than not, purchases are consummated offline and post-purchase online commentary is only a small part of a typical shopper’s activities. This is the role of the internet across three different products. Additionally, the internet is generally not the source people are most likely to use in the pre-purchase information gathering for these three products. 64% find out about music from family, friends, or co-workers. 46% go to one or more cell phone stores. 47% ask a real estate agent for advice. Search: How much people rely on the internet in product research and to what extent online information smoothes the path to a purchase decision. Influence: Where the internet’s influence is great (or not) in consumer’s decisions. Participation: Whether internet users get involved in online chatter or take other steps after purchase to engage with what they bought. Disintermediation: Whether the internet serves as a way to go around traditional means (e.g., going to retail stores) to buy products. Following discussion of findings in these four areas, the summary will go through the data on the three products that serve as the basis for the findings. Search: Online information can make product research more efficient and it can be particularly useful for a feature-rich product. But it is not the only tool buyers use to gather information. Information gathering is one of the most basic uses of the web and often the first step in consumer decision-making. It manifests itself in different ways for each of the products studied. Cell phone buyers face a wide range of choices among devices and service plans. Many of these choices are relevant to buyers, but at the same time it can be a challenge to sort through them. Thus, cell phone buyers rely on different types of input – salespeople, websites of vendors, blogs, and review sites online – to help structure their decision. The need for information is great in winnowing down the range of options, and the contractual commitment in many cell phone purchases adds to the demand for information. For those looking for a place to live, the internet helps buyers focus their search. Real estate searchers face a lot of choices, but not all of them may be relevant to their needs. The internet helps shoppers reduce the number of properties that require a trip to check out, as well as learn more about a transaction that has a high level of financial commitment. The story for music is a bit different because it is an experience good – the kind of product whose quality is discernable only after it has been consumed. This means that search has a lot to do with sampling. Internet users who are music buyers do this in a variety of ways – streaming songs to their computer, going to artists’ websites, or watching music videos online. Because an experience good requires a lot of information-gathering to assure the potential buyer the purchase will be worth the cost, music buyers don’t rely exclusively on the internet in their search. In fact, they are more likely to rely on mainstream media or recommendations from family and friends for inspiration for music purchases. Influence: Online information is generally modest in its impact on decisions, but looms larger when a purchase requires a big commitment. No more than one-tenth of buyers in each product category said that online information had a major impact on their purchasing decision. In conjunction with the finding that people use multiple sources, this suggests that the internet is part of a competitive information environment in product research. Because people are willing to use other sources for product research, this suggests online providers of product information have incentives to be reliable as they reach out to consumers. When the product in question requires a large commitment by a buyer, the internet’s influence on the choice is greater. The cell phone, which often requires a contractual commitment, and real estate, which typically requires a large financial commitment, demonstrate this. 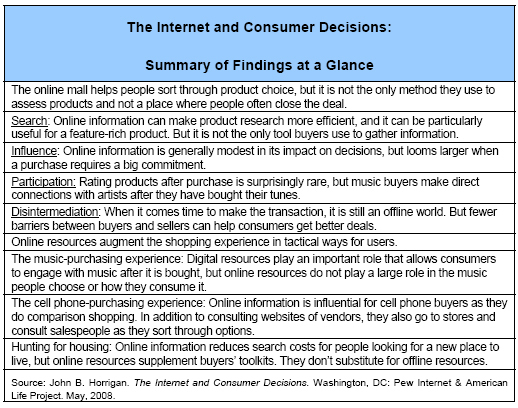 Some 10% of cell buyers (or 27% of those who used the internet specifically for research on their cell purchase) and 11% of home buyers or renters (or 23% of those who used the internet for research on their real estate decision) said online information had a major impact on their purchasing decision.1 Before making the purchase, internet users conduct extensive online research and, for many, it makes a difference in their final decision. For a good such as music – which involves less commitment but more difficulty in determining quality before purchase – online information competes with other sources as buyers search widely prior to buying. This lessens its influence on purchasing relative to the other products; just 7% of music buyers (or 12% of those who used the internet to find out about music) said it had a major impact on their choice. Participation: Rating products after purchase is surprisingly rare, but music buyers make direct connections with artists after they have bought their tunes. For each of the three products studied, few said they had rated the product they had purchased. 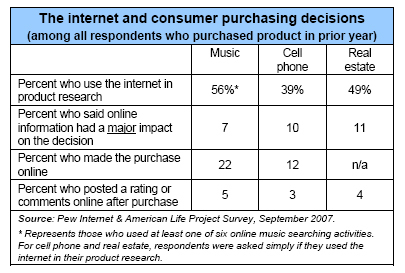 Among internet users in each product category, 6% of music buyers, 4% of cell buyers, and 4% of those who looked for a place to live posted commentary about their experience on websites or blogs. Far larger percentages of online users in each category (about a quarter of music buyers, half of cell buyers, and a quarter of real estate shoppers) consult these sources in doing their search. The large gaps between contributors and readers are understandable; not all consumers are interested in lending their voice and many may be content to free ride on the efforts of others. However, with the growth of broadband adoption at home and the buzz about online participation in a Web 2.0 world, widespread activity in this arena might be expected. Yet the data in this report do not show this; there is clearly a distance between the numbers of those who contribute and those who lurk. Music is somewhat different. Liner notes in albums used to be the most immediate way to learn something about a newly purchased album – potentially a conversation starter with a nearby friend. Now “digital liner notes” add a dynamic element to users’ voices as they can create or monitor a variety of conversations about music. For music buyers, this often takes the form of reaching out directly to artists’ websites (39% of online music buyers do this) or to like-minded fans at blogs. Even though few music buyers rate or comment on purchases, online resources such as MySpace constitute an active participatory space online, especially for young adults. Disintermediation: When it comes time to make the transaction, it is still an offline world. But fewer barriers between buyers and sellers can help consumers get better deals. The early visions of e-commerce – the “friction free capitalism” once touted by Bill Gates – saw producers and consumers transacting seamlessly. Cutting out the middleman would mean lower prices for consumers. But few buyers of music or cell phones execute the transaction online; most rely on traditional retail stores. 42% of music buyers said online information helped them save money on music purchases. 41% of cell buyers said they spend less as a result of information they got online. These figures suggest that, for some buyers, online information effectively improves their bargaining positions as they shop. There is, however, another side to the coin; people say online information can prompt more spending than might otherwise be the case. Among music buyers who use the internet to find out about music, 37% said the internet led them to buy more music than they otherwise might have. For cell buyers using the internet for product research, 43% said online information led them to get a phone with more features than they otherwise would have. Online resources augment the shopping experience in tactical ways for users. As useful as online information might be in the shopping journey, users’ reliance on multiple sources indicates that buyers use the internet in tactical ways. A music fan hears a song in a movie. That might prompt an online search to sample it, learn more about the artist, or check out what others think of the song. Perhaps that results in a purchase of the song or the entire album; if so, that’s likely to mean a trip to the store. Even for young adult music buyers, whose purchasing path is more reliant on the internet, this basic pattern holds. A real estate searcher might see an ad for a place in the paper or learn about it from a real estate agent. That might spur an online search to learn more about it, and quite possibly save a trip across town when the searcher finds the house or apartment isn’t for him. Or the online search might reveal a similar place nearby, but offered at a lower price. A cell phone buyer may see an attractive new device in a store and ask some questions of a salesperson. Further online research might show the phone has features the buyer may not use, but direct the search to a more appropriate (and maybe cheaper) device. Online information may make the difference in the final choice, but in conjunction with offline queries. In these examples, online information shapes the choice, perhaps even in important ways. As the data show, however, the internet is not usually the major factor that influences the final decision. This may be partly attributable to some internet users concerns about online security in shopping, which discourages the use of online resources to shop.2 Nonetheless, the relatively small influence of online information on shopping decisions also has much to do with people using multiple sources in their buying journey. The music-purchasing experience: Digital resources play an important role that allows consumers to engage with music after it is bought, but online resources do not play a large role in the music people choose or how they consume it. Music buyers seek out a wide range of resources as they think through the music they may want to purchase, but offline sources dominate. People are more likely to find out about music from traditional media or families, friends, or co-workers than from the internet. 83% of music buyers say they find out about music from hearing a song on the radio, the television, or in a movie. 64% say they find out about music from friends, family members, or co-workers. 56% say they find out about music through various online tools, such as going to a band’s or artist’s website or streaming samples of songs to their computers. 51% said online information had no impact at all. 37% said online information had a minor impact. In general, 62% of music buyers who used the internet to learn about music say an offline source mattered most compared to 32% who said something on the internet made the most difference. Music purchasing still generally means buying a CD and buying in a store. 82% of music buyers say that all (62%) or most (20%) of the music they buy is CDs. 15% say at least half their purchases were individual digital files. Even for young adult music buyers (defined as those under age 36), music purchasing still is dominated by CDs (69% buy most or all of their music on CDs), with 27% purchasing digital music files at least half the time. 74% of music buyers say their most recent purchase was at a store, while 22% said it was done online (either ordering a CD or a paid download). 44% of music buyers transfer the music to a CD, computer, or MP3 player. 44% of music buyers have done at least one online activity relating to their music purchase, such as going to an artist’s or band’s website or reading blogs about the artist or band. Internet-using music buyers use the internet post-purchase to connect directly with artists. 39% go to the artist’s or band’s website. 28% look online for live performances by the artist. 13% either post their music to a social networking site such as Facebook or post their own reviews of the music they purchase. Post-purchase online activity can encourage additional buying. Overall, 26% of internet users who bought music in the past year said online resources led them to buy more music. Among internet users who bought music in the past and who did at least one post-purchase activity online, 40% said online resources led them to buy more music. The cell phone-purchasing experience: Online information is influential for cell phone buyers as they do comparison shopping. In addition to consulting websites of vendors, they also go to stores and consult salespeople as they sort through options. 59% asked an expert or salesperson for advice. 76% go to website of cell phone manufacturers or cell phones. 59% use websites that compare cell phone features and prices. 50% consult reviews of cell phones on websites or blogs. 7% post queries in chat rooms or on listservs seeking information on cell phones. 46% said online information had a minor impact. 27% said online information had no impact at all. 78% of cell phone buyers purchased their device in a store. 12% of cell phone buyers bought their device online. 48% said it changed the model or brand of cell phone they bought. 43% said online information led them to get a phone with more features than otherwise would have been the case. 41% said online information helped them spend less on their cell phone. On balance, users are generally satisfied with the cell phones they buy. Three-quarters (78%) of cell buyers said they felt they had the right amount of information in considering their purchase and 87% are either somewhat or very satisfied with the cell phone they bought. After people buy their cell phone, post-purchase online chatter is minimal, as only 11% look online for information on how to use their phone and 4% post a rating of their new device online. Hunting for housing: Online information reduces search costs for people looking for a new place to live, but online resources supplement buyers’ toolkits. They don’t substitute for offline resources. 49% look through ads in the newspaper. 31% ask friends, family members, or co-workers. 15% consult TV or radio. For those who move to a new city (53% of those in the sample looking for a new place to live), the internet is more heavily relied upon (60%), but so is a real estate agent (55%). 58% say the information they got online helped introduce them to their new community. 57% say it reduced the number of places they looked at. 29% say they thought online information helped them save money on the house they bought or apartment they rented. Most internet users who use online resources in their housing search say that search has some influence the choice they eventually make. 36% say it had a minor impact. 42% say it had no impact at all. 5% discuss their new place or neighborhood in an online forum or community. 4% post comments or ratings online about real estate agents and others they dealt with in finding a place to live. 4% post comments about their new place or neighborhood on a website or blog. 3% join a neighborhood listserv.